Friendship is just not a relationship of mutual affection between people, it is a real meaning of feelings of care, respect, admiration, concern, love, or like. 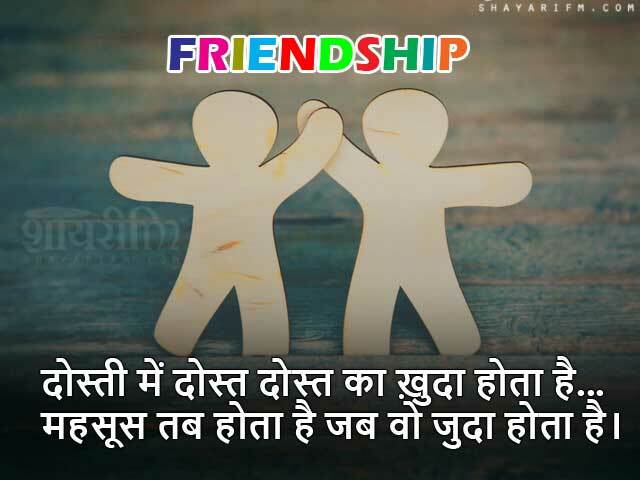 Express your sentiments to your true friend with our finest collection of Friendship Shayari, Friendship Sms and Friendship Status of 2019 in Hindi and English script. Khuda Ne Dost Hi Itna Pyara Diya Hai. Mahsoos Tab Hota Hai Jab Wo Juda Hota Hai. Apne-Apne Hisse Ki Dosti Ko Nibhayenge. Hansti Aankhon Se Aansoo Nikal Aayenge. Dosti Vaada Hai Umr Bhar Saath Nibhane Ka. Dost Kam Rakhta Hoon Par LaJawab Rakhta Hoon. Na Kisi Ki Najron Se Na Kisi Ke Kadmon Mein. 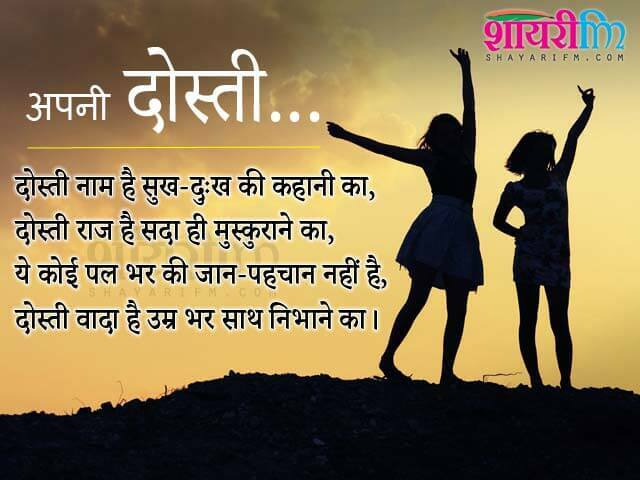 Read here our latest collection of friendship shayari, new true friend sms, best-friend shayari, hindi friendship day sms, dosti shayari, shayari for friends in hindi, Friendship status for facebook and whatsapp, Dosti Sms for friend, girlfriend or boyfriend. Share these Shayari, Sms and Status with your true friend.